Water-cooled electric tile saw designed for cutting sheets of stone, masonry etc. 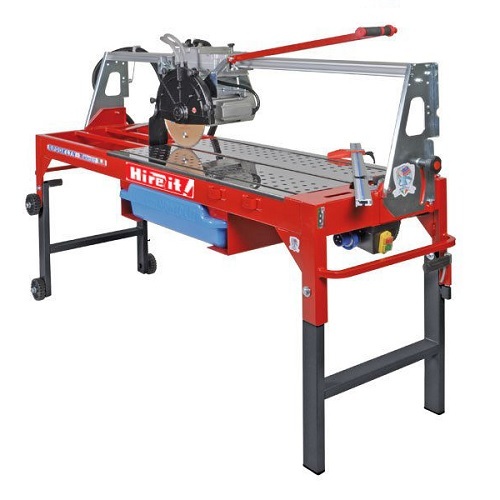 This professional saw cuts slabs up to 163 cm length and between 0 and 9cm thickness. Perfect for diagonal, Jolly and angled cuts. This version 230v has a 2,2 kw motor. Super professional diamond blade included. Recommended for tiles cutters who have to cut large 1m x 1m porcelain tiles or very thick granite and marble. Maximum length of cut 160cm. Diagonal cutting length 115 x 115cm. Maximum thickness of cut: 60mm in single pass, 120mm in double pass. Tilting motor assembly for bevel cuts for 0 degrees to 45 degrees. Easy to remove Polypropylene tank for easy cleaning. Folding legs equipped with wheels for easy movement. Made of aluminium, steel and stainless steel with triple paint coating. Disc support arm with a special rotation fulcrum, which allows a wide range of vertical travel and use for trimming tasks.